Hong Kong based OneSky offers a comprehensive solution for localizing and translating web and mobile apps. The service supports translation to over 50 languages, not just the most popular international languages, and is designed specifically for web service and mobile app translation and localization. The ability to upload externalized strings, documents, etc to a central repository where they are managed and translated. The ability to export and convert between a large number of localization file formats, such as PO, XLIFF, and others. The ability to invite and manage translators, similar to the way you manage authors and editors in a content management system. The ability to order paid translation from the vendor or a partner LSP (translation agency). Control over permissions, for example to allow for tiered translation processes, where a less privileged group of translators do a first pass translation, which is then cleaned up by trusted reviewers. Ability to mix a variety of translation methods, including machine translation, crowd/user translation, and paid translators. Using OneSky to translate your project is pretty straightforward, and consists of a few simple steps. The first step is to upload your project’s externalized strings and prompt files. OneSky supports all of the major localization file formats, such as PO, XLIFF, YAML and many more. Next, you select translation methods for each project and each target language. You can use machine translation (recommended only for UI/UX and layout testing), crowd/user translation, or paid translators. 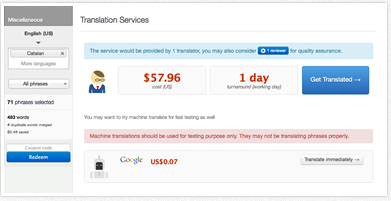 OneSky’s translation rates start at 10 cents/word, with several different quality levels. 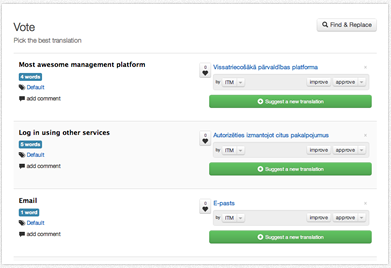 Next, you can track translation progress, review and post-edit translations after they are done. Finally, you can export the completed translations, either in the original file format, or converted to another format. This is a nice feature that facilitates porting from one system to another (there is no standard localization file format, so if you switch from PHP to Ruby, for example, you’ll need to convert from PO to YAML files). OneSky offers a fairly comprehensive solution, but they really stand out in their focus on mobile, not just localizing mobile apps, but in providing translators with the ability to edit and review translations from mobile devices. This is quite important because mobile is the dominant means of Internet access in many countries, and because freelance translators, especially younger people, are more accessible via mobile. Making it easy for translators to jump in and translate anytime, anywhere has a dramatic impact on translator availability. In my opinion, this is a mandatory feature, something all localization service providers should support in the near future. OneSky also stands out for providing a very nicely thought out crowd translation process. Your product’s users simply click on a “Help Translate This Site” link that, in turn, prompts them to sign in with their Facebook account. This eliminates the need for translators to manage yet another identity, making the registration process painless. Users can immediately start submitting translations, which are scored by other users, and can also be vetted by trusted reviewers. This is the basis for a “crowdsafe” translation process that is highly automated, but has quality control processes in the background to prevent bad translations and poor translators from getting through. OneSky is a comprehensive and well thought out service that is well suited for localizing web services and mobile apps. If you need to manage more complex projects, you’ll probably want to include some tools like Transifex and Smartling. 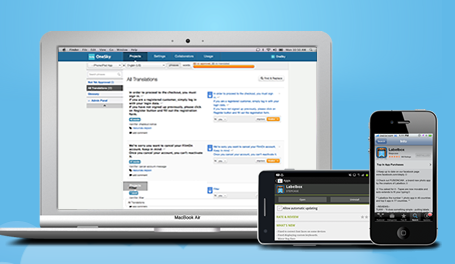 OneSky also offers a REST API for customers who want to fully automate the management of their prompts and translations. In general, it is difficult to say that a particular vendor is the best. What I recommend to clients is that they test two or three services. If you only have one project, do localizations into several languages, but use a different service for each. If you have several projects, use a different tool for each one. This will enable you, your translators and project managers to evaluate each tool in real-world use, and to decide which they prefer. Assessing the quality of these services is pretty subjective, not just in terms of translation quality, but what type of translation editing tools users and translators prefer, system integration options, and so on. Watch for a tutorial about how to evaluate and select localization management tools later this month. There are a number of companies that offer services similar to OneSky, including Transifex, Tethras, Smartling, Transfluent, and GetLocalization. This entry was posted in APIs, crowd translation, game localization, localization, mobile app localization, translation community and tagged localization, mobile, onesky. Bookmark the permalink. You should also try https://poeditor.com/ for localization and crowd translations. It’s one of the best, to my mind. @essatrout, thanks for the tip. I just added a profile for POEditor. Great, hope more people find out about it.